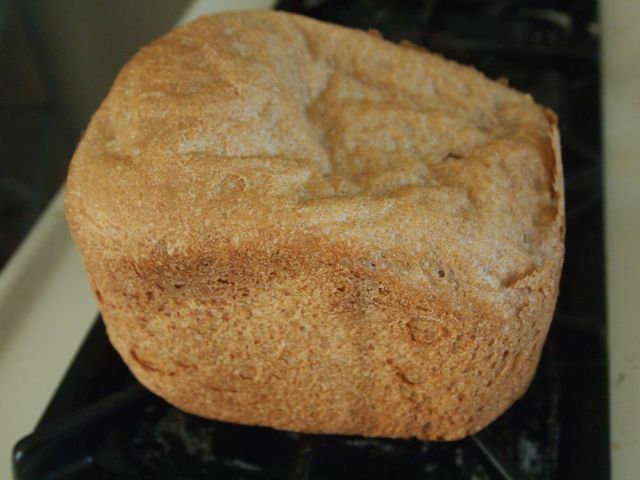 Paul’s comments on this post about eating well for under $190/month inspired me think more about whole grains, which in turn inspired me to try to make whole wheat bread, rather than our staple French bread. There’s some white bread flour in this recipe, but there’s still a whole lot more fiber than in our usual fare. At first, sometime last week, this led to colossal failure in the form of quinoa whole wheat no-knead bread. I won’t link to the recipe. It’s probably not the recipe’s fault. The bread is in the compost, because otherwise it might have killed a duck. Thankfully, colossal failure was followed by success, using the recipe below. You can get a lot of detail by following the link to the recipe that I stole from used. Yes, I returned to the bread-maker. [Someone just asked which breadmaker we use: Ours has been going strong for three years, makes good bread and allows you to take the paddle out before it bakes. ] As I have mentioned on this blog, I'm a big believer in gradual change. From buying bread to making bread in a bread maker. 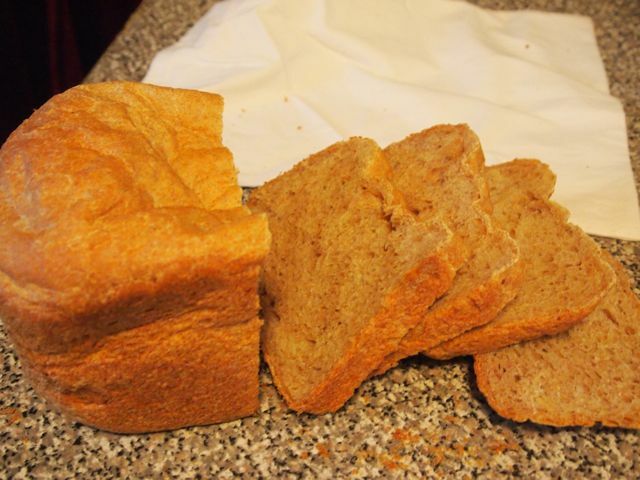 From making white bread in the bread maker, to making whole wheat bread. Today I picked up The Tassajara Bread Book from the library, and am already feeling inspired to get to know how to make bread without relying on the bread maker. My dream is to be able to bake a loaf of bread (or a few loaves, since I guess the oven time might use a lot of gas) without feeling totally tied to a recipe. I'd love you to join me if you'd like to be able to bake bread. We can have a little community of beginners. Use the 1.5lb whole wheat loaf setting. How much would you pay at a bakery or grocery store for comparable quality bread? I think you can get the cost down to less than a dollar by buying the flour, the most costly item, in bulk, but this is for beginners rather than you pros out there! I stopped buying bulk from Costco because the brand for white bread flour seemed a bit dodgy (though I enjoyed it for a full year!). But for whole wheat flour, I believe they sell King Arthur. Have readers had success asking their coop to sell them bulk orders of flour at lower cost? Related to an earlier post about reducing our trash, I read this post about keeping bread fresh without plastic. Growing up we always had a bread box, but Eug and I never bought one. Up until recently, I was reusing a transparent plastic bag. But the bag finally died. I’ve been using a fabric bag (which I’ll review next Monday evening!) and we eat it quickly enough that the bread doesn’t go off, but I probably need a wooden bread box or a tin or something. I just don't want to buy one, so I'm checking out the streets...Wherever in the world you are, how do you feel about fresh bread? And how do you get it?